I must admit that when The Bottom Line Music Club closed it doors back in 2004 I took it as a harbinger of the mid-level music scene in New York City slowly drying up. To my pleasant surprise I was totally off the mark and live music venues – even around my own neighborhood in Brooklyn – have proliferated. The newest addition to this selection of great entertainment spaces is Stage 48. Located in NYC’s Hell’s Kitchen section (650 West 48th Street, just off 11th Avenue) the club will offer a multi-faceted experience with a two-tiered concert space as well as a third floor restaurant called Z Bar, and roof-top Sky lounge area. At a capacity of approximately 1100 concert goers the main room is a good fit for acts that draw crowds too large for Highline Ballroom but too small for Terminal 5. The restaurant can double as a small music space, which seems the perfect size for showcases, and the main room will additionally serve as a great late night dance hall or event center. Stage 48 has been in the works for over a year with the finishing touches currently being completed. 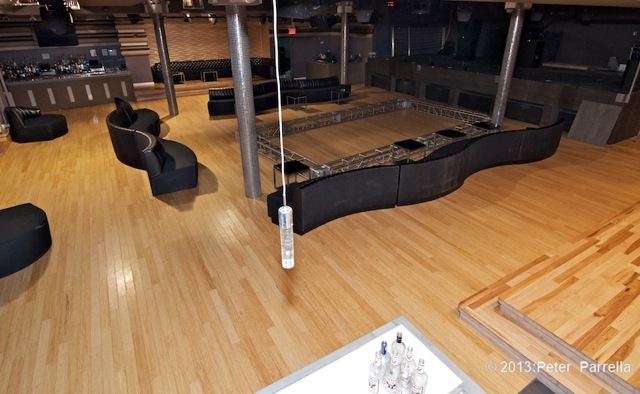 Though offering a few warm-up shows and events since New Year’s Eve the space is set for an official opening in March. Thanks to Marketing Director Liz P., Ken Pierce of the PiercingMetal website and I were able to get you an early, behind the scenes, look at the expansive complex. Ken has many more details and more of my photos at his site. Click this link to go there. He will also be a go to for some ticket giveaways when the venue launches. Stage 48 will offer New York Tri-State area music fans another jewel in the embarrassment of riches that is NYC’s concert scene. Don’t miss the opportunity to check out a show in the already growing list of dates coming up at the venue.